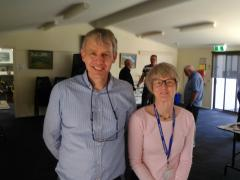 More than 30 U3a members and friends attended a stimulating and challenging lecture in Anglesea entitled ‘Climate Change: Knowns, Unknowns and Uncertainty.’ The lecture was delivered in a very entertaining manner by Professor Christian Jakob. Professor Jakob is a professor in Atmospheric Science at Monash University, and is currently Deputy Director of the Australian Research Council’s Centre of Excellence for Climate System Science. Avoiding political ideology, Christian was clear that wide scientific evidence shows that the mean global temperature is definitely rising, having risen already one degree over the past 100 years with the fastest acceleration since the 1950s. Despite there being a range of high and lower temperatures, the last four years has seen another rapid change. We, says Professor Jakob, are responsible because the human use of fossil fuels is the only source of the concentration of Co2. The future, according to Professor Jakob, is more difficult to predict with different models having different prediction outcomes. It is fairly clear, however, that there is the possibility of large changes in weather extremes and heat waves with on average 12 more days annually over 35 degrees. This lecture, organised by Mary Taylor, bodes well for the term four activities beginning on Monday. U3A SurfCoast, Senior Citizens Building, 16 Price Street, Torquay, VIC, 3228. Copyright © 2019 U3A SurfCoast. Website template by Bar Bending Designs. V 3.0.